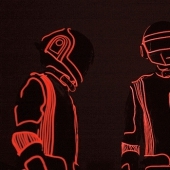 "Robot Rock" / "Oh Yeah" / "Touch It" / "Technologic" / "Television Rules the Nation" / "Crescendolls" / "Too Long" / "Steam Machine" / "Around the World" / "Harder, Better, Faster, Stronger" / "Burnin'" / "Too Long" / "Face to Face" / "Short Circuit" / "One More Time" / "Aerodynamic" / "Aerodynamic Beats" / "Forget About the World" / "Prime Time Of Your Life" / "Brainwasher" / "Rollin' And Scratchin'" / "Alive" / "Da Funk" / "Daftendirekt" / "Superheroes" / "Human After All" / "Rock'N'Roll""Human" / "Together" / "One More Time" (Reprise) / "Music Sounds Better With You" / "Stardust (Instrumental)"
I hear Alive 2007 since january/2008 and I never tire. Classic set from da space cadets!!!! Saw dem in dublin, day play da same set worldwide on da alive tour.. even dough i new da set before da concert was still blowin away by da visuals, music and atmosphere :) happy days lol!! !